Holiday’s are something of an anomaly to me. It seems is though when you’re stuck in everyday life, you don’t want to stop, even when you need to. As a self-employed husband, I feel the pressure to earn, so taking a holiday can cost me more than the price tag at times. As a result, we haven’t had a “Going-Away” holiday for three years. I did the math, and I’m embarrassed to say it’s correct. But we were able to save most of last year in the anticipation that we’d need to go away by now. And we did. 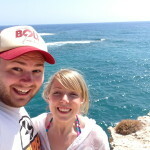 We were blessed enough to get a beautiful private villa in Cyprus. It’s the third time we’ve been to Cyprus and, as always, it delivered. In fact, I’d say this was the best yet, possibly best holiday ever. 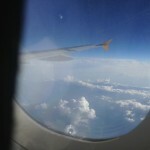 Not being much of a traveller of late, I thought I would write our activities of the last week. Ignore it if you like, but I want to remember this fantastic break. Travelled to Cyprus, to arrive at dusk. We were given our Chevrolet Cruise rental car (a step up from the Nissan Note we’d ordered! ), and drive to the villa. An adventure in itself, as I’d never driven an automatic car before. Once at the villa (now fully dark), it still looked stunning. The pool was lit and the stars were out. As we dumped our bags down and got settled into the villa, we were looking forward to the week ahead. Shopping mainly. Stocking up in some essentials, you know, like ice cream and sweets. We also got a giant watermelon that we STILL haven’t finished on the last morning here. Had my favourite food of Cyprus, the McDonald’s Greek Mac. Now that is heaven in a wrap. What an experience. Firstly 38’c. Ouch. But secondly, what a great zoo. Originally it was a bird and reptile park (still slightly evident with the sheer volume of the above – best reptile variety I have EVER seen), but was expanded to a zoo very recently. Now it included some gorgeous Giraffes, Zebras, Camels, Ostriches… The list goes on. 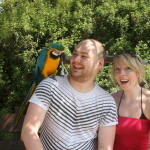 We held a Blue and Gold Macaw parent called Georgina flowed by a brilliant bird display. A brilliant day out. All topped off with a Pizza Hut take-away, including the Cyprus Special which had huloumi cheese on it. Delicious. Lazzzzzy day. Slept in. Relaxed and blogged. 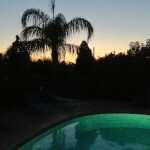 In fact every time I mention relaxing by the pool, I wrote a chapter of my book. But more on that at a later date…! 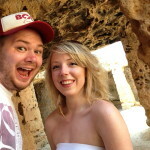 Becky really wanted to visit the car boot sale/market in Paphos which was only there on Sundays. So we drove passed at 10am to see two cars with some questionable goods. Could have been some dodgy dealing going on. So we skipped that and went to our traditional favourite, Tomb of the Kings. I suspect ill write more about the Tomb of the Kings in days to come, but safe to say for now, it’s such a special and romantic location for us. That was followed by a well-earned Greek Mac, then back to the villa for a relaxing afternoon by the pool. 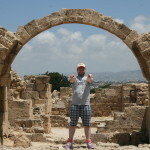 We discovered ANOTHER archaeological site in Paphos, the Roman ruins. Again, absolutely stunning. We saw some of the most in-tact roman mosaics in the world. Fantastic day out. Highly recommend this. After that, we went to Maccers again. This time I had the Greek Chicken. It’s basically a Greek Mac, but chicken instead of beef. Not as nice as the Greek Mac, but still really nice. From there, did a bit of food shopping and went back to relax at the villa. Now starting to gear down ready for the return day (tomorrow). We went to the kiosks and shops to buy gifts and top up our sweet reserves. We then had a KFC and followed a dirt track to some extremely remote sea caves. Beautiful. The bright white rocks in the afternoon sun burned my calves like crazy. Totally worth it though. Then went back to the villa to relax and start the packing before finishing all the food in the villa in a massive evening feast. Yum! Today will be a crazy day. In fact, I’m not really sure why I’m blogging and not getting everything ready. We have to be out of the villa by 10am (local time), and we go to the airport at 6:30pm. So it’s gonna be a living-on-the-road day. Quite exciting really. Plans are to buy more of the sweets we ate yesterday, go to a local steakhouse we’ve driven passed several times, do a bit of go-karting and visit the area we came to on our honeymoon. Got the plans, lets see how we’ll we follow them! All going to plan, we’ll be back in rainy Gatwick at 11:30pm.